It's time to collect some daisies! Pull the rope and collect as many of them as you can, avoiding obstacles on your way. Change lanes using the arrow keys and maximize your points. Gumball has a new hobby and the main idea of it is to collect as many daisies as possible. In order to do that he should use a bungee rope. Tie it around your waist and accelerate forward, collecting dolls and avoiding obstacles ahead. Collect rings on your way back and set a record! 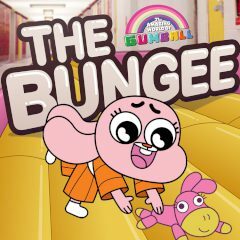 Games Similar Gumball The Bungee!